I'll be the first to say, since my recent trip to NYC, I haven't been interested with the food scene in Los Angeles. The recent restaurant openings of Sotto, Son of a Gun, and Lukshon has not interested me one bit, and probably never will. However, when I was invited by Darin to a benefit dinner at the Breadbar in the Century City mall headlined by Hiro Urasawa of the famed Urasawa, I knew I had to try it. Ever since my previous dinner at Urasawa, I've been meaning to try his cooking again. Along with Hiro Urasawa (Urasawa), we had Noriyuki Sugie (Breadbar), Michael Cimarusti (Providence), Walter Manzke (Formerly Church and State), David Myers (Comme Ça), and Ramon Perez (Sona) collaborating on this 6 course tasting menu. Priced at $110 sans tax and gratuity, all of the proceeds from this dinner (along with another dinner at Comme Ça) goes directly to the Japan Earthquake relief aid. A great cause, and hopefully for us, a great meal ahead. 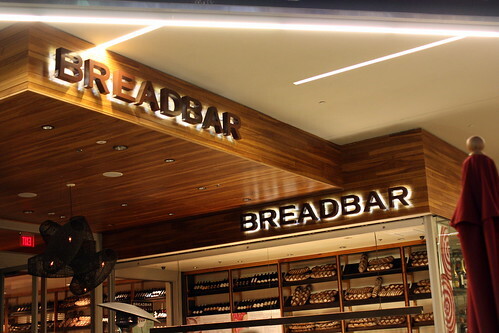 You'd assume the bread from a place called "Breadbar" would be out of this world right? Sadly it was merely passable, but I enjoyed the soft butter that accompanied the bread. Since I wasn't here for the bread, it's no big deal. 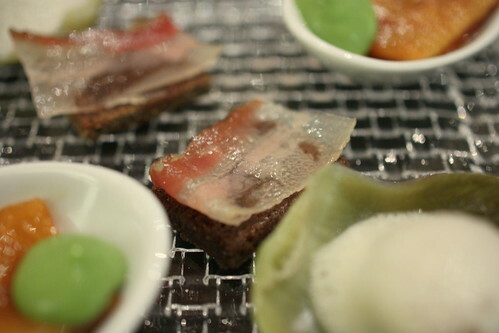 Here to start: a trio of canape. I'm a fan of artichokes, and I enjoyed this starter. 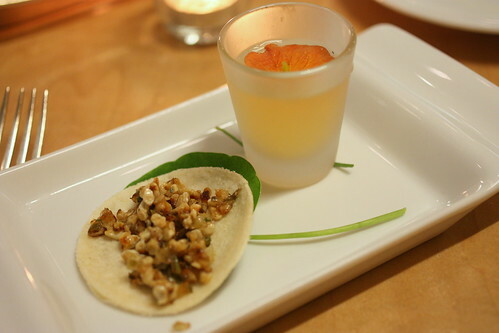 This was a light and refreshing starter. Next we have shaved lard on top of pumpernickel bread. While I enjoyed the taste of the aged lard (similar to lop cheung (Chinese sausage)), I didn't particularly like the pumpernickel pairing. This was my favorite of the trio. I enjoyed the sweet taste of the eel, which tasted similar to the eel found on Japanese eel rice (unagi don). 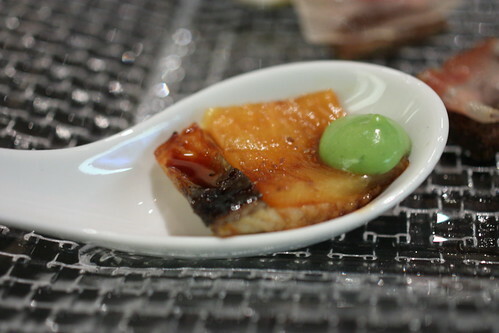 The pineapple that went with the eel was a wonderful complement. 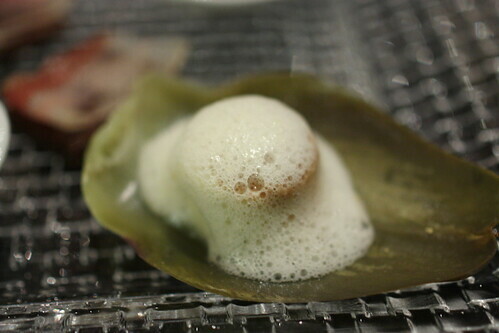 This was my most anticipated course of the evening, a dish by Hiro Urasawa, and it fails to disappoint. 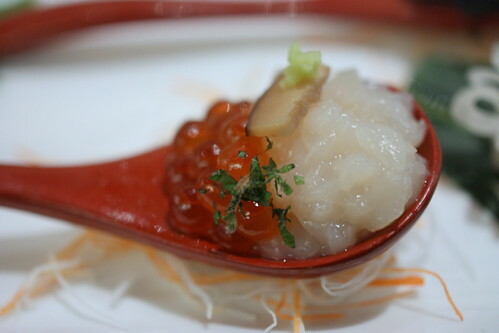 I enjoyed the flavors of the scallops and ikura, but the texture of the scallops were slightly mushy, but that said, it was a wonderful bite. 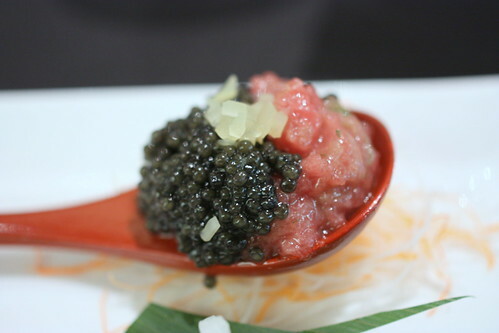 The second tartar of toro and caviar was definitely my favorite of the duo. 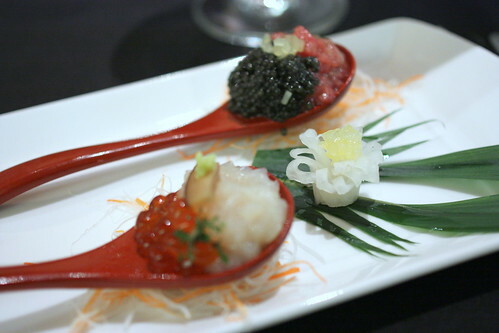 I hope I'm not being partial since toro and caviar are two of my personal favorites, but that mouthful was quite delicious. 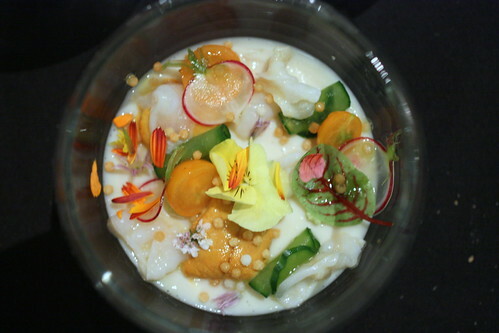 Along with the duo of tartar, the accompanied daikon flowers and vegetables were delicious as well. Next up was my favorite course of the night. 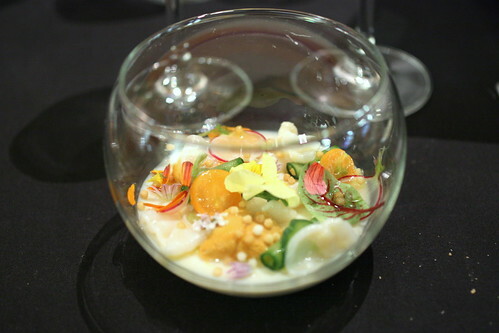 The aesthetically looking, as well as the tasty looking dish was prepared by Providence's Michael Cimarusti. The soymilk panna cotta by itself reminded me of an unsweetened dou fu hua or tofu flower, which is a popular Chinese dessert. However when he added the Santa Barbara sea urchin, geoduck, tomatoes, wasabi and other components, it created something truly magical, epic even. This dish was one of the best things I've ate in the past year. 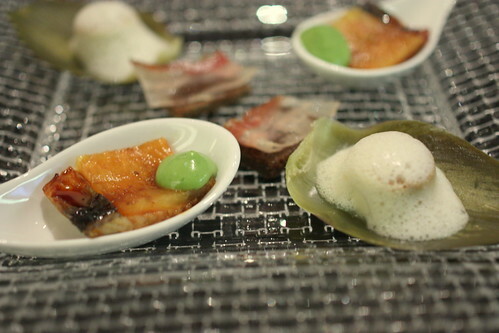 Eating this course really made me wish Chef Manzke would quickly open up a permanent place here in Los Angeles. 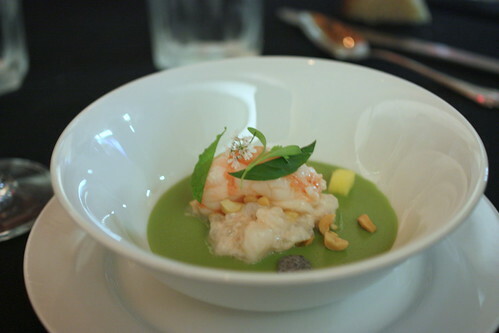 The initial layer of the pea purée was creamy and delicious, but the second layer of Thai curry was even better. 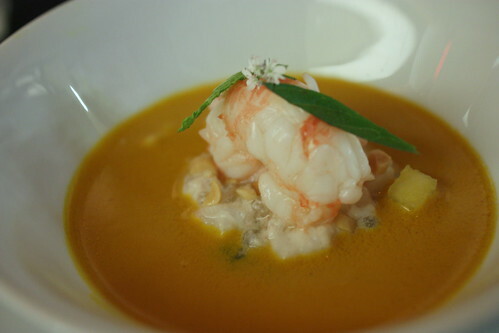 It went wonderfully with the perfectly cooked piece of prawn. I couldn't have asked for a better dish from Chef Manzke. Trust me, there wasn't a drop of curry or piece of shrimp left when I was done with this one. Thankfully, we closed the night on a strong note with a dessert prepared by ex-Sona's Ramon Perez. The base itself was subtly sweet and delicious. The accompanied alpine strawberry was SO good, the sorbet was wonderful, and just as a whole, this dessert was truly delicious. This was my kind of dessert! The paired sparking sake was something new for me. I definitely need to get a bottle for myself. 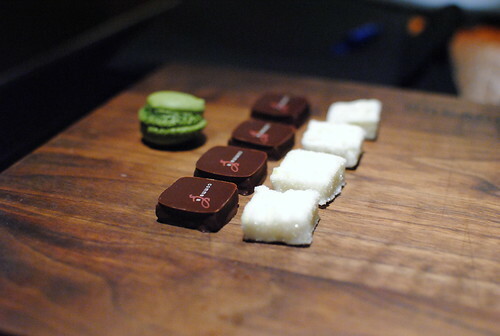 The trio of mignardises were great, especially the green tea macaron. 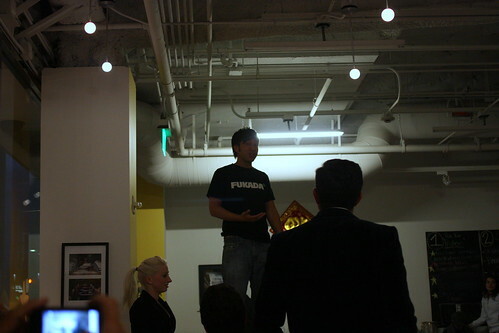 I just wish they served it to the tables instead of placing it at the one corner of the room. I thought the meal as a whole was very strong, even if there were a few thing I didn't particularly cared for. 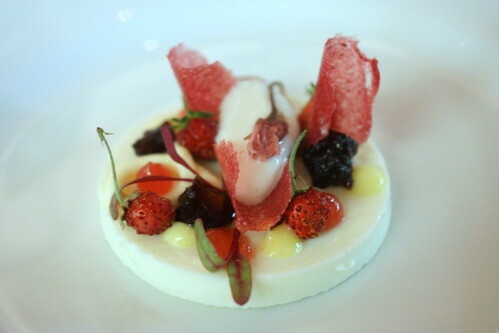 I do hope Chef Cimarusti would add that soy panna cotta to his tasting menu at Providence, because it was a definite hit with the most of us diners. In the end though, we have to remember this meal was more than for us to eat good food, but it was for a great cause. 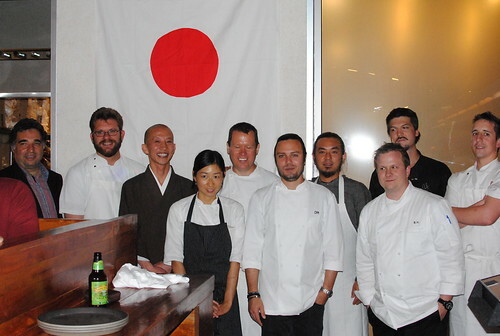 Bravo to all of the chefs who participated in this event! I'd like to take a quick break from my recent Taiwan Beef Noodle Tour posts for something interesting that's coming to Downtown Los Angeles. 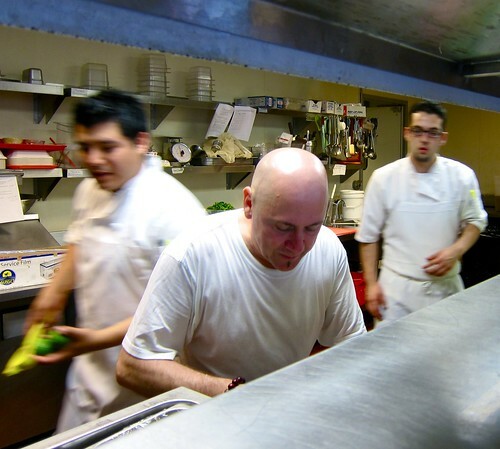 As some of you may know, Laurent Quenioux was the former executive chef and owner of the recently shuttered Bistro LQ. What you may also know is that he's recently taken the helm of Vertical Wine Bistro in Pasadena. However, what you may not know is that Chef Quenioux will be starting a pop-up venture of his own at the Downtown eatery, Starry Kitchen. The upcoming 5 course prix fixe dinner will be priced at $45/person (excluding tax and gratuity). I've had the privilege of dining at Bistro LQ awhile back, and even though I've yet posted that dinner due to my laziness, I was very impressed by experience there. After receiving an invitation to try his yet to be opened pop-up venture, I quickly booked a seating. 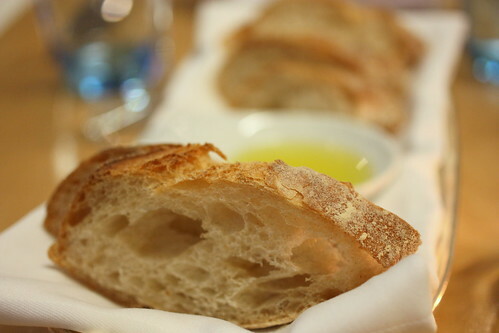 At the start of our meal, we were presented with a bread basket from Bread Lounge and olive oil. 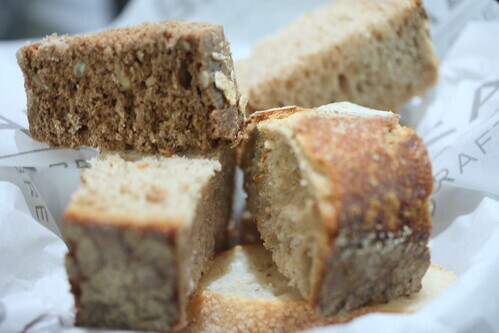 Even though I was saving room for the main courses, I managed to take down two pieces of bread. 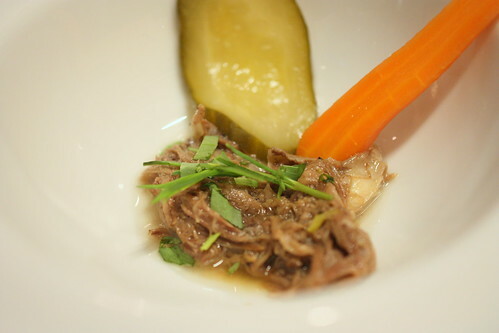 The first course was oxtail, which is one of my favorite proteins, though it does seem I have a lot of favorites. Anyways, the oxtail was cooked perfectly. Tender, flavorful, it was quite delicious by itself. Though I'm not sure if the use of the pickled vegetables were necessary for this particular dish. I was hoping for some sort of starch, like potatoes. I guess I'm just a meat and potato kinda guy. Truthfully, when I first saw the menu, I wasn't too interested in this course. While I like snapper, I didn't think any of the ingredients stood out, but boy, I was mistaken. First and foremost, the snapper itself was cooked pefectly. Tender, moist, and fork tender. 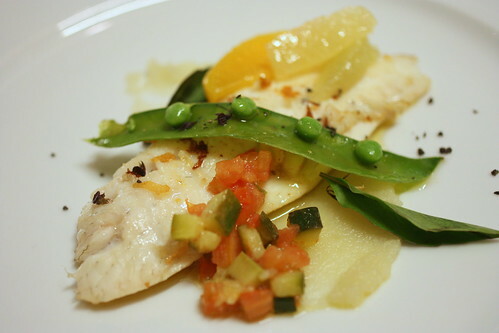 I really liked the uses of the lime and tangerines in this dish, it provided the necessary acidity needed to go along with the fish. 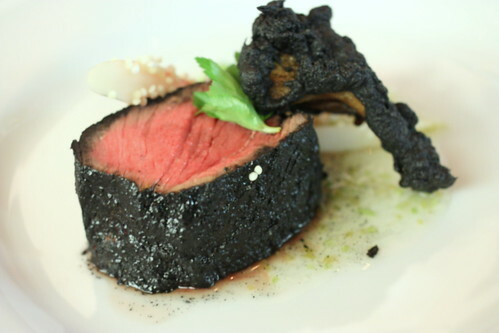 The smoked black salt added an interesting, and tasty component to this course. I really enjoyed this one. This was my favorite course of the night. 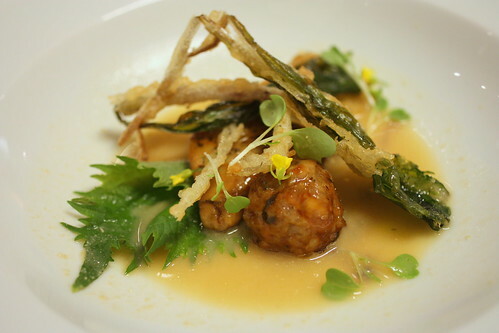 Rabbit, foie gras, and fried vegetable tempura? Yes, please! 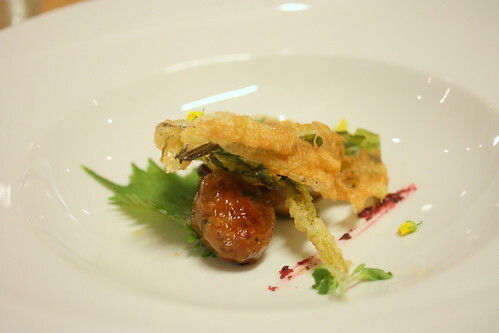 I really enjoyed the combination of the rabbit "meatball" and the well cooked piece of foie gras. 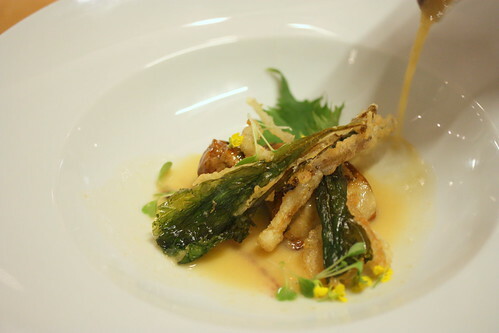 The added touch of the fried vegetable tempura and the miso sauce elevated this dish to the top. "Winner winner rabbit dinner!" 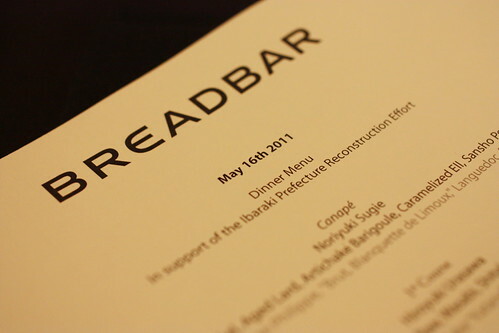 It must have been my lucky night, as sweetbread was on the menu. No, this wasn't some sort of sweet fried dough. 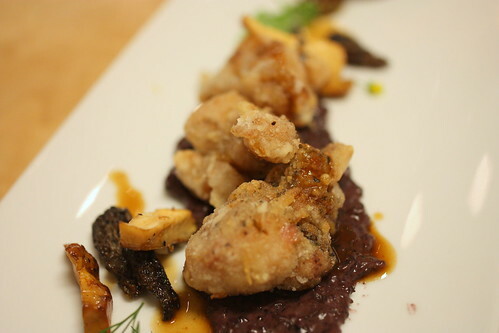 Sweetbread is usually the thymus of a calf. I liked the use of the morels and the chanterelles in this dish. 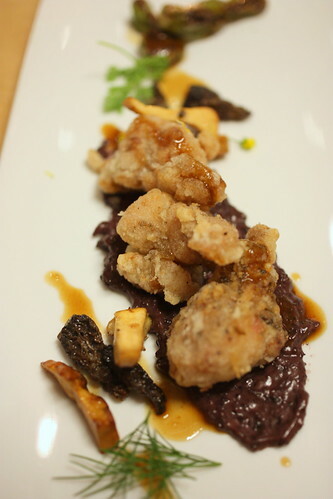 The sweetbread was fried, much similar to a fried chicken, but better. I personally didn't think the use of the shishito peppers were necessary, but I enjoyed it nevertheless. Ah, my arch nemesis: the fried dough, in this case, a churro was used. 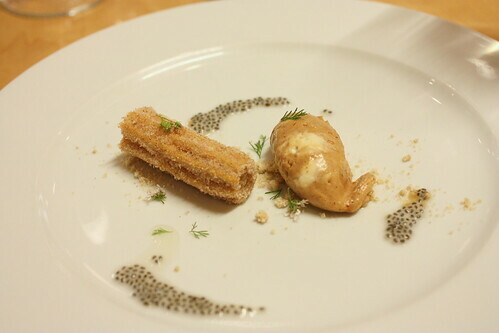 However, I believe the churro was quite vital in this dish. The chocolate chipotle mousse was quite nice and definitely packed a punch. 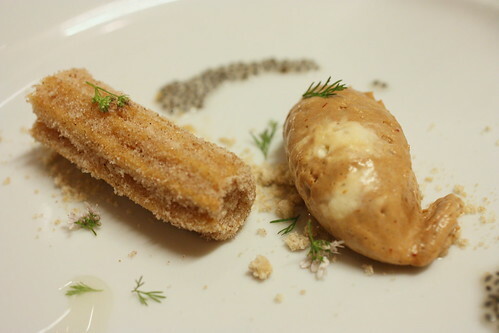 I needed the churro to balance the flavors out a bit. The addition of lime was quite pleasant. This dessert definitely had a Mexican influence. I quite enjoyed this dessert. In my opinion, this dinner was quite a success. Although I had an idea what to expect going into this meal, Chef Quenioux exceeded my expectations. I liked the balance of flavors in his dishes, and I enjoyed his use of various Asian and Mexican flavors to enhance his French techniques. A few housekeeping items: While the pop-up doesn't officially start until Sunday June 5th, I was excited to try this dinner before it officially commence (though just a note, this was not a hosted meal). The planned time for this run will be for the next 3 to 6 months, from Sunday to Tuesday nights, every other week. Although all the wine from this particular dinner was paired by Domaine LA, Starry Kitchen does not have an alcohol license, thus, there will not be any optional wine pairing offered during the course of this run. If you would like to add any type of alcoholic beverage to your meal, you'll have to do it a la Wolvesmouth or Ludobites. If you need more hints than that, please feel free to email me or contact me on Twitter. If you need more information about this upcoming pop-up, I'd recommend for you to follow Chef Quenious on twitter. My final word of advice, since this is a limited run, seating may be limited, thus, I'd suggest for you to book your reservation ASAP! 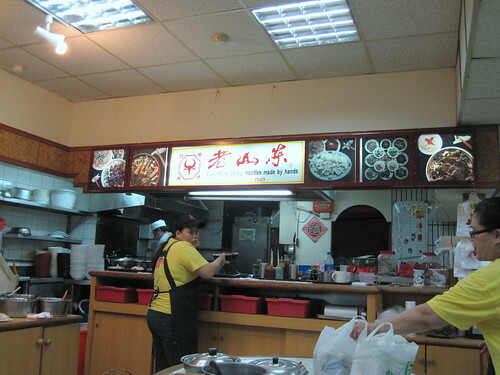 Lao Shan Dong, as the picture above shows, was established back in 1949. 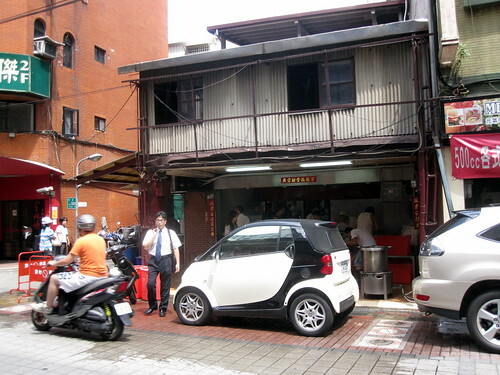 Located in the basement of Wan Nian Shopping Center (萬年大樓), in heart of the XiMenDing (西門盯), a popular area of Taipei, it's been under the same ownership since the very beginning. 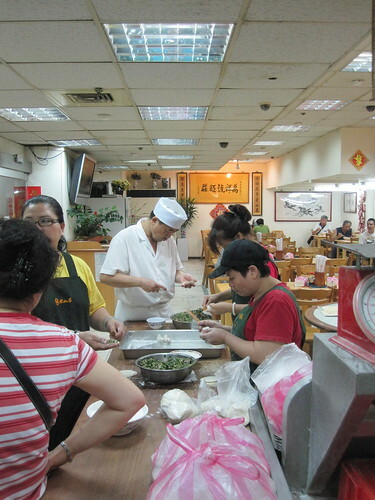 While the restaurant has been handed down through the generations, the quality of the food remained consistent. I've eaten at Lao Shan Dong as a kid growing up in Taiwan, and have continued to patron here during my yearly trips back to Taiwan. 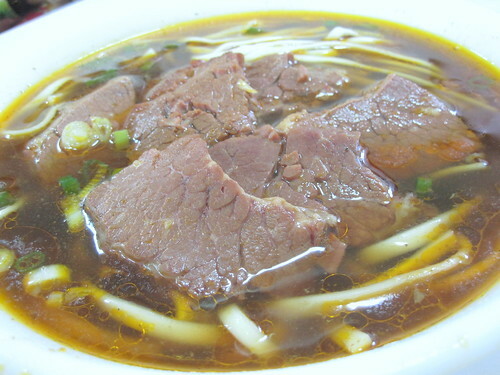 This past visit was no exception, as Lao Shan Dong is one of my family's favorite place to eat beef noodle soup in Taipei. Why do we go back so often? 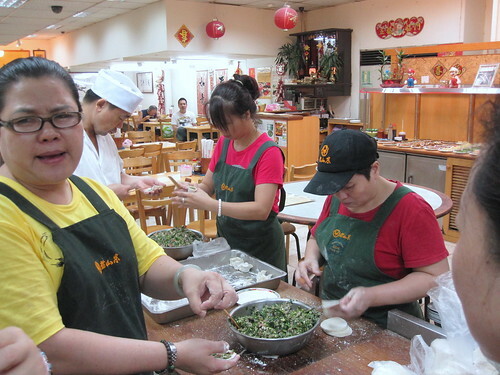 Well, as you can see here, everything from the noodles to the dumplings are handmade. Also, the owners were originally from the ShanDong Province (山東省) much like my mom's side of the family, thus it's definitely flavors they're used to. Above, the owner (in yellow) was chatting with my mom and aunt. 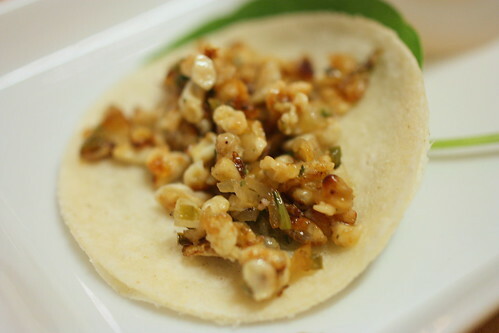 This is a must order item at Lao Shan Dong. 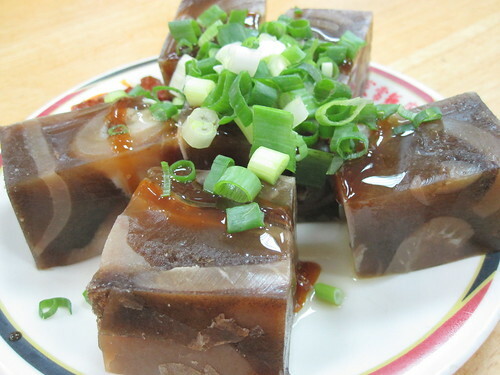 Loosely translated by me as pork gelatin, or 肉凍 in Chinese, this gelatinous' primary ingredient is pork skin. 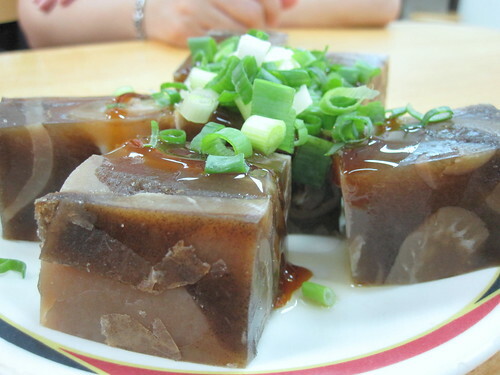 Thus, I've probably turned off most of the readers, but if you're one that enjoys pork skin, this pork gelatin is fantastic. 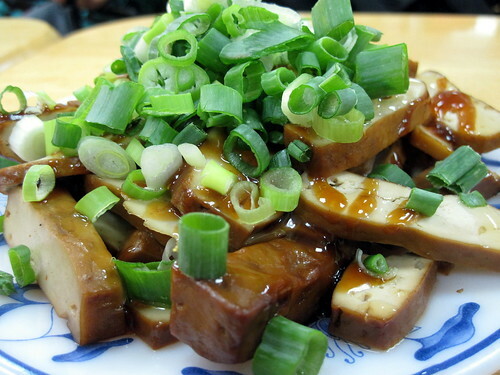 You'll get a bit of meat, a lot of skin, and add a bit of chili paste and thick soy sauce (醬膏), it's delicious. 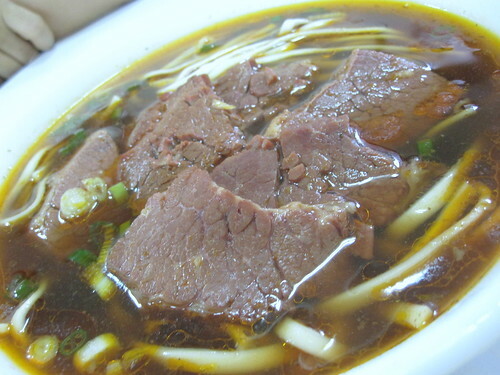 This is a staple at most beef noodle soup places. You really can't go wrong with a delicious plate of beancurd to go along with a bowl of beef noodle soup. 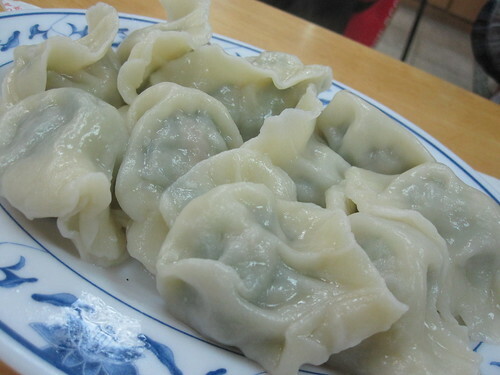 If you're eating at any Shandong-nese establishment, it's a sin by not ordering a plate of dumplings. The owner told us that they get the skin specially made by this one guy for the past forty plus years and there hasn't been a change in the family recipe since the inception of the restaurant back in 1949. The chive and pork dumplings were juicy and delicious. I'd highly recommend it. The broth and the noodles were the definite stars of this bowl. 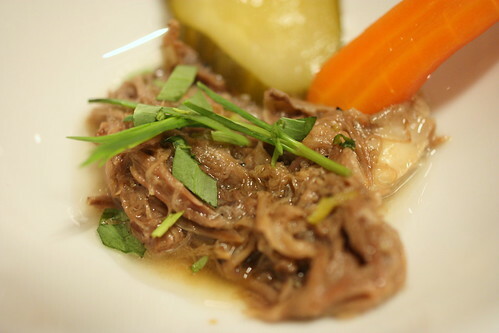 The richness of the beef broth was evident and its oils were quite flagrant, yet not too intense. The noodles were of the knife cut variety, my favorite. The beef was plentiful and tender. 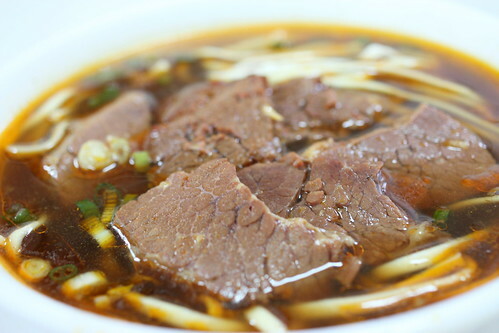 All in all, it was just a wonderful bowl of beef noodle soup for me, and this is easily a top 3 bowl of beef noodle soup in my book. I can't wait to go back for another bowl of this stuff later on this year! 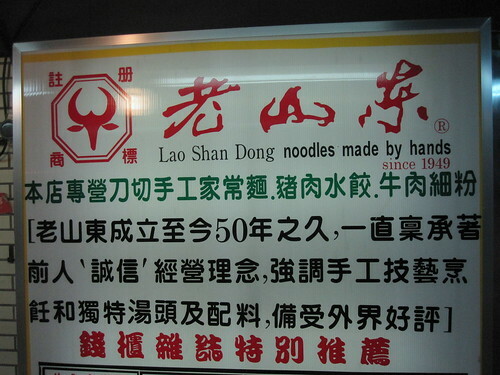 Lao Shan Dong has made a few changes since its inception back in 1949. While the restaurant has gone through a few interior makeovers, the food, thankfully, has not. My family has been eating here before I was even born. I mean, if this is a place where both my mom and I both approve of, can you pass on this? 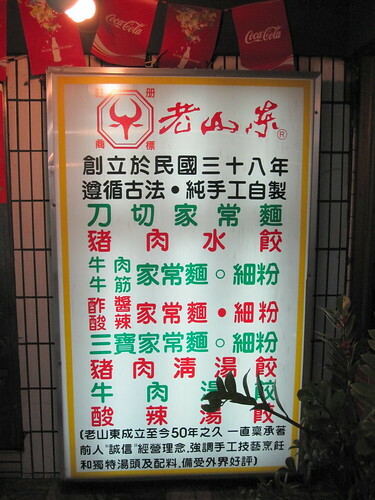 There are a lot of good stuff on the menu, but don't pass on the pork gelatin, dumplings and the beef noodle soup! So here it goes, the start of my beef noodle soup (or as some refer to it as NRM) tour of Taiwan. Although this will only cover some of my favorites in Taipei, I'll hopefully be traveling to a few other cities in Taiwan over time and document those bowls as well. The first bowl of beef noodle soup is a classic, and one of my personal favorites, though it'll be a common phrase I'll be using in the coming weeks. 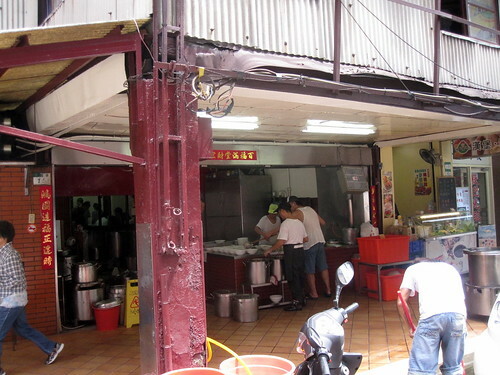 This beef noodle soup shop lacks a signage, a name, and yet, it's always packed. 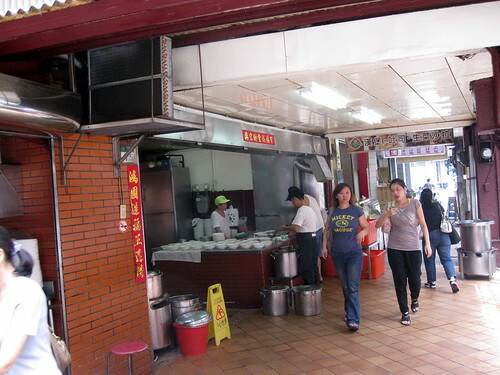 Us locals often refer to this shop as the beef noodle shop on Hen Yang Road. Hen Yang Road is an area of town cluttered with bookstores, and jewelry stores. This is an area my family and I often visit to exchange US currency into the New Taiwan Dollar(NTD). 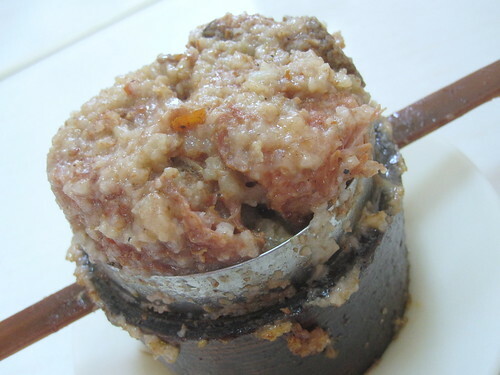 I'm not sure what's the exact English translation for 粉蒸排骨 (feng zhen pai gu), but I'll call it rice steamed pork ribs. This small bamboo steamer contains sweet potatoes, pork ribs which were covered in this seasoned rice mix that's used for steaming. The end result was this perfectly cooked pork ribs with a delicious Chinese five spice flavor. It's quite tasty and a must order item here. 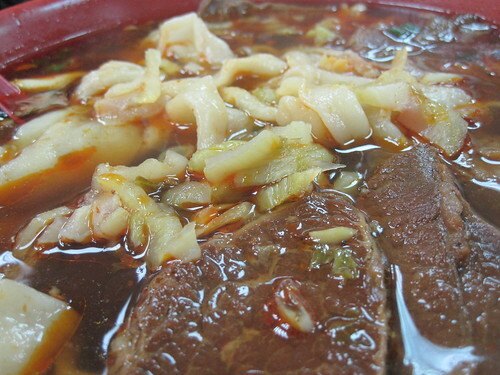 Now for the main event, the stewed beef noodle soup (紅燒牛肉麵). 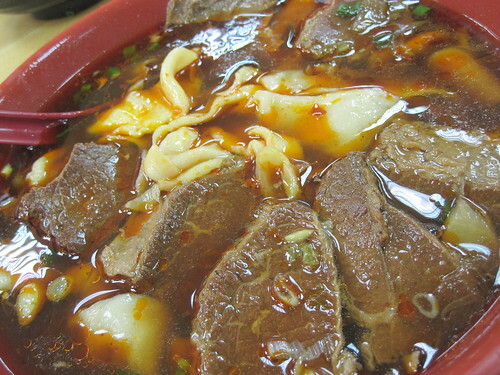 Even though a clear beef noodle soup was offered, don't bother with it, stick with the stewed beef noodle soup. It's their best thing there. I'll admit, the soup itself was quite oily, loaded full of beef's delicious oil and flavor, it could be a bit too much for some. For me, it's perfect. The flavors of the broth was intense, flavorful, and all around fantastic. The beef was cooked tender, and just the perfect amount reside in the bowl. The noodles themselves weren't my favorites, but worked well with this broth. 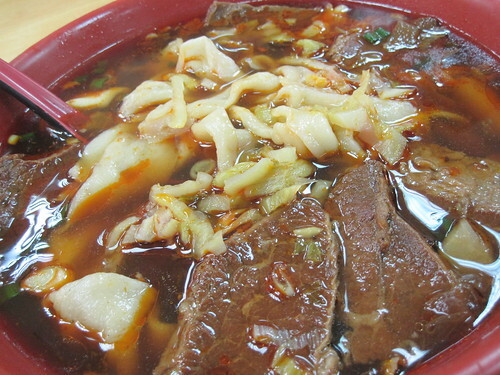 And of course, no Taiwanese beef noodle soup is the same without some mustard greens on top. 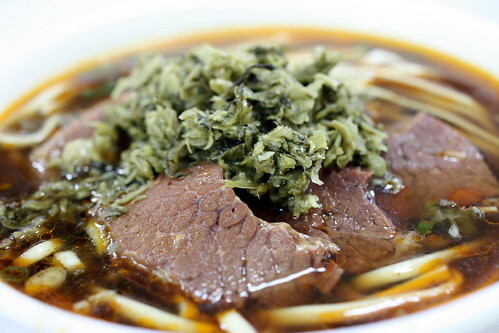 I usually add the mustard greens quite liberally as I enjoy the sour flavors added to the beef noodle soup. 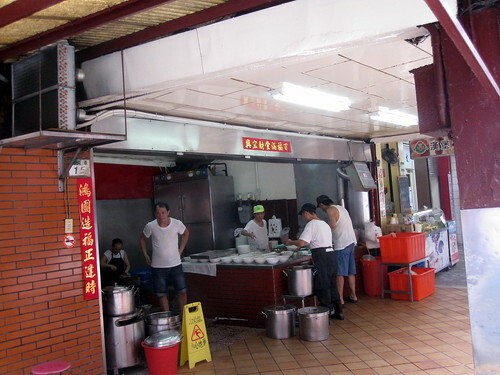 For me, no trip back home to Taipei is the same without stopping by here for a bowl of stewed beef noodle soup. There has to be a reason why this shop is older than I am, it's really quite good!